Buying a New House Vs Renovating Existing Home - Which is Better? Buying a New House Vs Renovating Existing Home – Which is Better? While a shiny and new home sounds nice in default, there are more factors for you to consider. In this post, we listed the most likely pros and cons that you ought to keep in mind when determining if you should buy a new house or renovate an existing home. The best thing about buying a new house is it’s – well – new. You can start over in a new place, a new neighborhood and a new home. 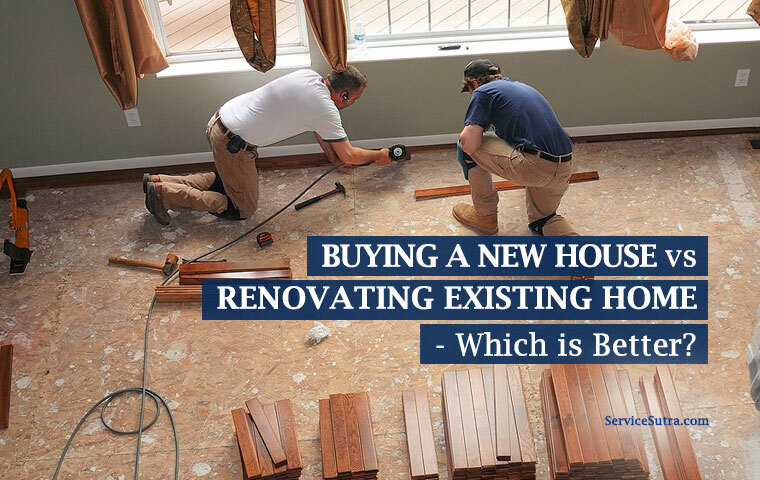 Let’s face it: no matter how much you renovate your current home, it will never be a brand new home, and if you buy a home, you have a chance to finally get your dream home as it is easier to customize and fix. As a bonus, moving to a new house will give you a chance to declutter your things. You can finally chuck out anything you don’t need or love. If you are tired of living without modern amenities, acquiring a new home suitable for this lifestyle may be the better choice. New homes are more equipped in accommodating the latest technology. It can range from alarm systems, speaker systems, Internet wiring to cable. Older homes tend to disregard the integration of green appliances. If you’re looking for a way to incorporate energy efficiency in your home, getting a modern home is the better solution than renovating. You can customize your new house to have solar panels. It can contribute to the Greener Earth campaign and at the same time, you can save money on electricity with it. Structural foundations like ceilings, floors, and wall can also be insulated to lessen more your electricity bill. When buying a new home, you can get a financing option with your builder. It makes getting a mortgage easier than qualifying for home equity in renovating. This ease of purchase helps people to find a new home in a short time. As always, a strong credit score and a sizable down payment is the best way to secure a home loan. Luckily, shopping for mortgage now is not as difficult as the traditional home loan hunting. Recently, there is a growth of online lenders in the market. Online hunting can help you find the best loan option out there. There’s no need anymore to set-up tons of face-to-face meetings with lenders and no more grueling follows up with them as you have direct access with them online. Check out this list of Best Online Mortgage Lenders of 2018 to get you started to the path of buying a new home. The newness of the house will keep repair issues away for at least 10-20 years. With brand new appliances, plumbing and heating, you are free from the financial trouble of maintenance. Packing and unpacking everything in your home takes a lot of time. If you don’t have the time to commit, it can be a problem when buying a new home. For some of us, we value the sentimental aspects of a property. This includes our home. It contains countless memories you may not be ready to let go. If you find it hard to leave your old home and move to a new one, renovating may be a better choice. Renovating offers a customizable plan. If you’re only changing a part of your house, it is possible with a renovation. The process also provides the avenue to do DIY work. If you’re willing to put in some time and get a little dirty, DIY projects like this will help you update your home without taking out a second mortgage. Plus, you can experience the personal satisfaction of undertaking a creative venture. The best part? DIY renovation improves your home high standard without breaking the bank. You can get your renovation project right by planning it in details. You can visit Floorplanner and RoomSketcher to create a simple house plan. You can also use Pinterest to collect ideas and references for your home. Renovation also allows your budget to flow with what you really need to do. Unlike the hefty cost of buying a new home, you can renovate on a tight budget if you want. If you don’t have to remodel everything, this a great way of saving money and improving the look and function of your home. And here’s the kicker — it’s possible to raise the value of your home to an amount that exceeds your renovations expenses. Consider the costs of the renovations you’re undertaking and compare this to the return you expect. In a nutshell, renovating will improve your home and raise your net worth. Home equity can help you save money when renovating. Of course, make sure that you qualify for the loan. Inevitably, time can ruin a house. For the old house, there’s always something to fix. Gaps in your windows, cabinets that swing open, uneven or bouncy floors and stair-step cracks — the list goes on. While some DIY projects can be cheap and easy to do, there are expensive repairs that will simply go over your budget. Installing a new roof and kitchen remodel are two of the most reno expensive projects out there. Replacing plumbing and wiring can also exceeds your budget. Renovations can be messy and disruptive. If the coverage of the projects is the whole house, you may even need to temporarily relocate. You can expect material shortages, contractor delay and budget overruns. It will take months to renovate your house. If you go down the DIY lane, it will take even longer. Renovating your house in a room to room basis can affect your usual routine. For one, if you revamp your kitchen, there is a good chance you can not use it in the meantime. Unlike when buying a new home, the work is done for you and you only have to wait a few weeks to complete the transaction. Every municipality has building rules. You need to have permit on major renovations, and if your existing home is outdated, you will be required to adhere to the current building standards. This planning consent from your local council is crucial to start your work. DIY renovating run the risk of over-improving it. Unplanned projects may cost you more than a professional would. It still depends on how confident you feel about your skills, and some jobs are almost always better off left to the professionals such as electrical work and plastering. Over to you: what would you prefer buying or renovating? We have already discussed about the pros and cons of both buying a new house and renovating an existing home. It all depends on preferences of individuals, for me I would prefer renovating an existing home than buying a new home. Once renovated, I can well reinvest the remaining funds and make more money, than going for home loan and all.